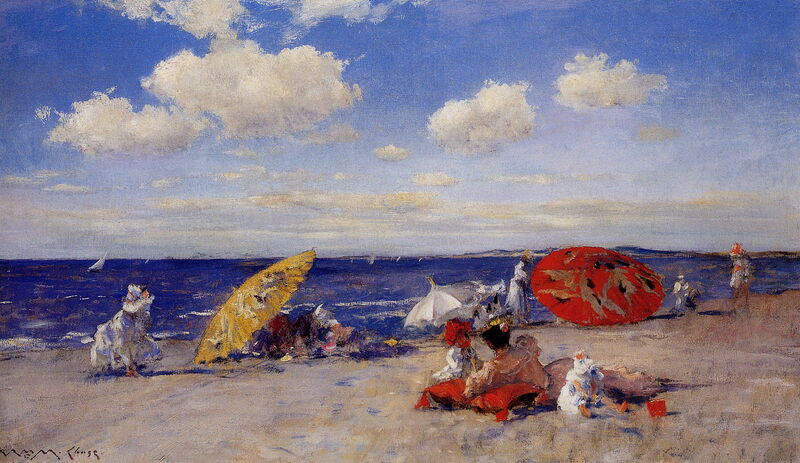 This is the third in the series of biographical articles to commemorate the centenary of the death of the American Master painter William Merritt Chase (1849–1916). 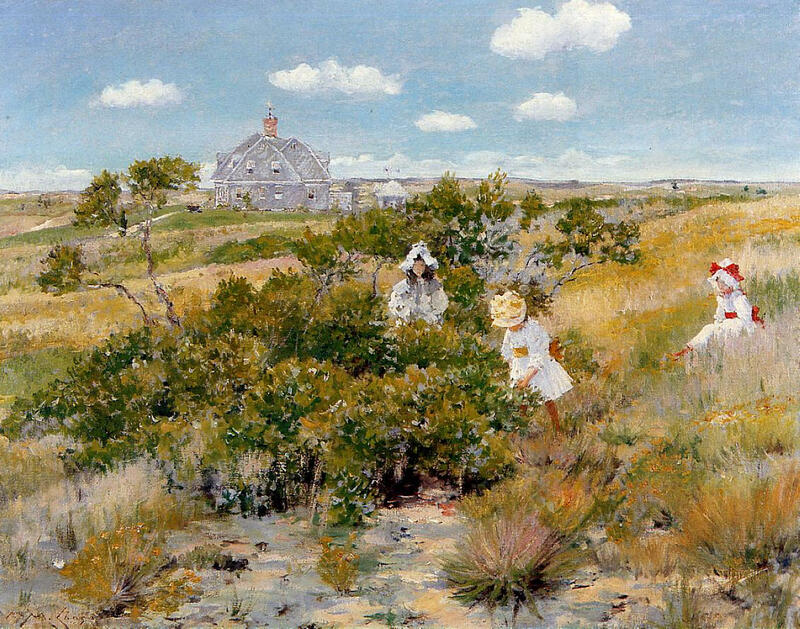 This instalment covers the period from 1891 to 1900, during which the Chase family spent their summers at Shinnecock on Long Island, where the artist taught at the annual plein air Summer Schools. By 1891, Chase had a highly successful studio in New York City, an international reputation placing him among the world’s leading artists, and a rapidly-growing family living in Greenwich Village. Although he was teaching, that remained a relatively small commitment, and his landscape painting was largely limited to views of the city parks. 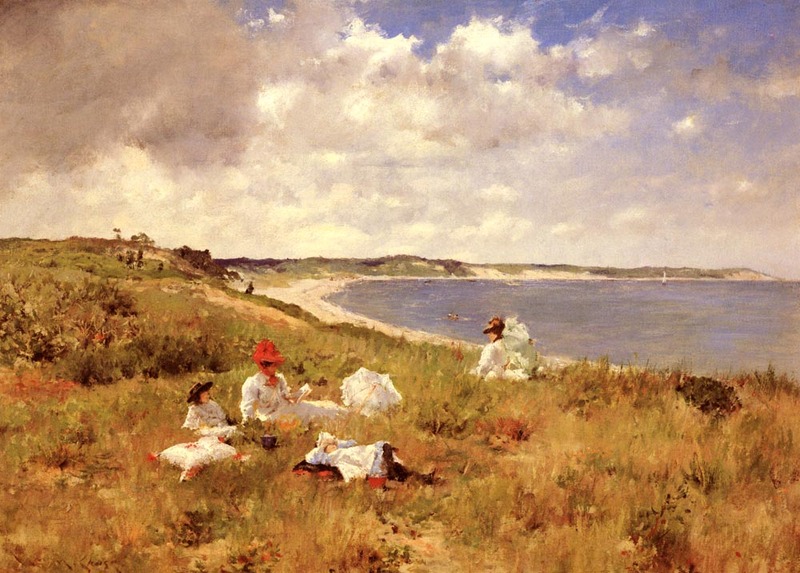 This changed markedly in 1891, when Janet Hoyt invited him to direct her new plein air painting school in the new Art Village in western Southampton, on Long Island. 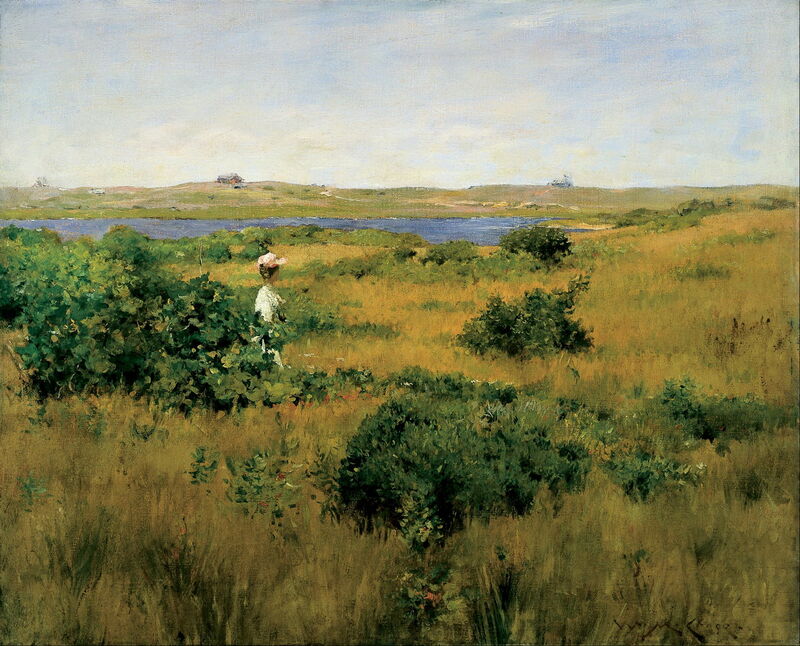 He accepted, and for the first summer moved out of the city to spend the season teaching and painting in the Shinnecock Hills. 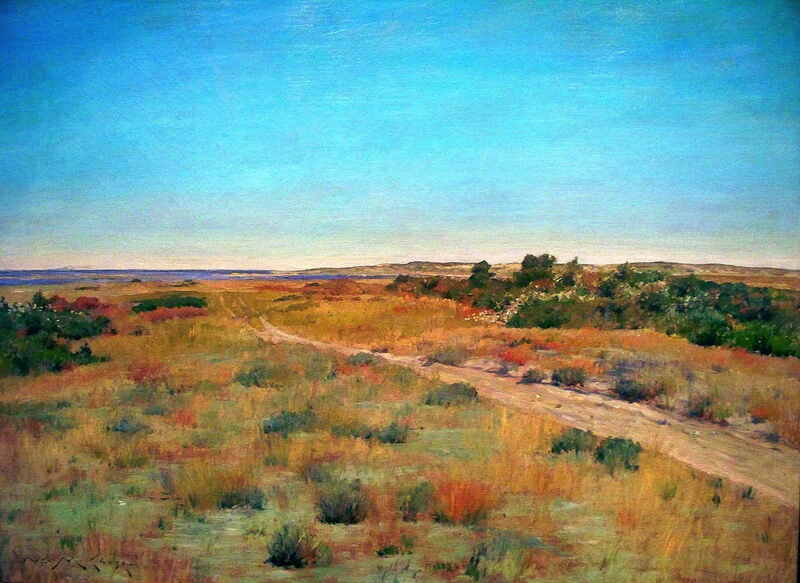 This marked the start of his most productive phase of landscape painting, during which he painted a succession of superb canvases depicting the rough scrub, old tracks, and deserted beaches of the eastern end of Long Island. 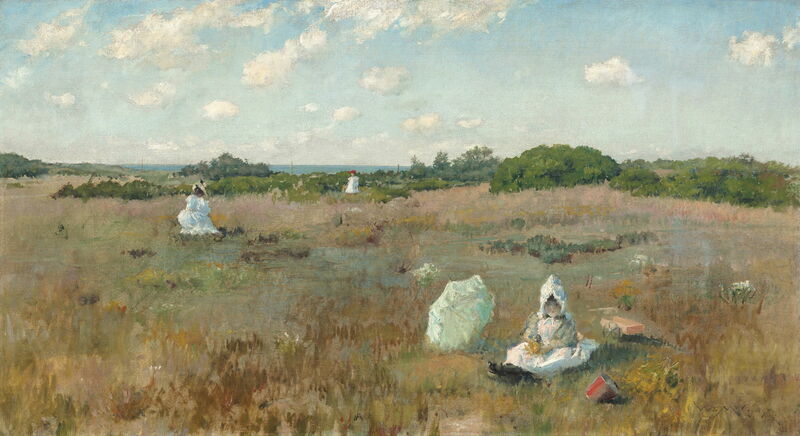 William Merritt Chase (1849–1916), Summer at Shinnecock Hills (1891), oil on canvas, 67.3 × 82.6 cm, Cincinnati Art Museum, Cincinnati, OH. Wikimedia Commons. 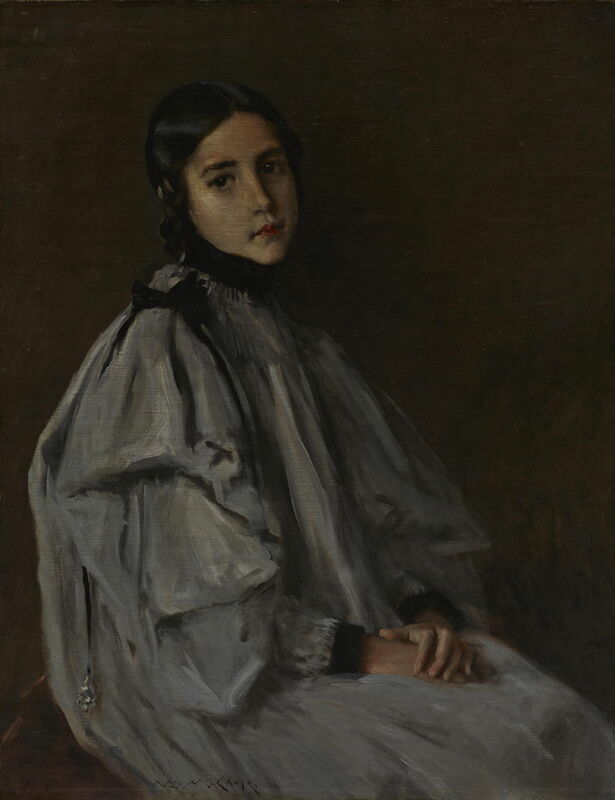 His students – here Lydia Field Emmet (1866-1952), who became a leading portraitist in the twentieth century – also proved a steady supply of models for portrait paintings. Chase seized the opportunity of these Summer Schools to move his family out of the city, and commissioned his friend Stanford White to design a summer home for them. 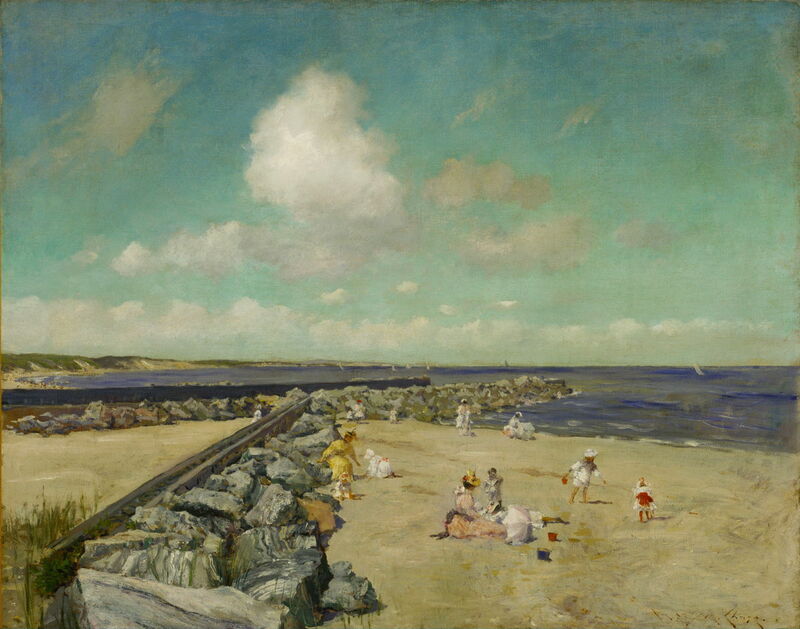 This was completed in time for them to use their new house in the summer of 1892, when he was back in Shinnecock teaching and painting for his second season. 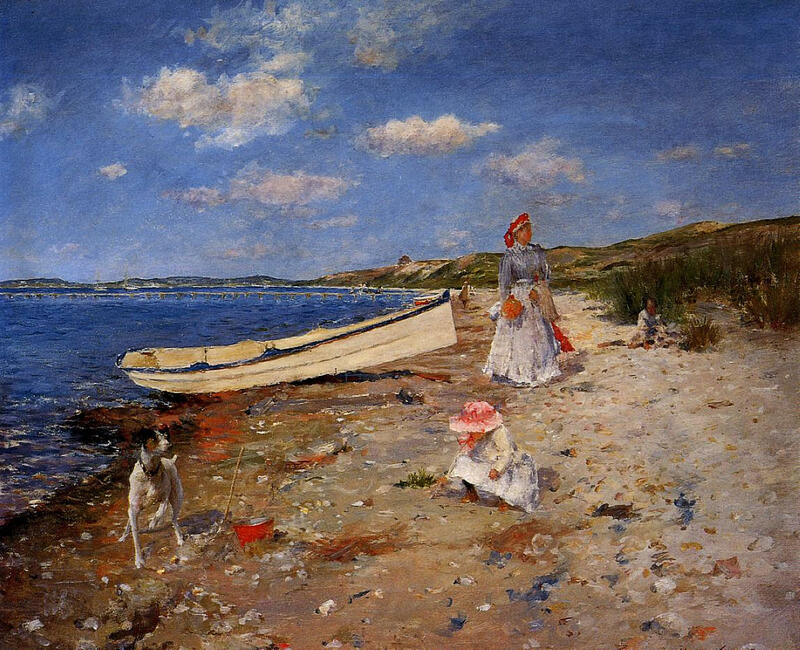 William Merritt Chase, A Sunny Day at Shinnecock Bay (1892), oil on canvas, 46.99 x 60.33 cm, Private collection. WikiArt. 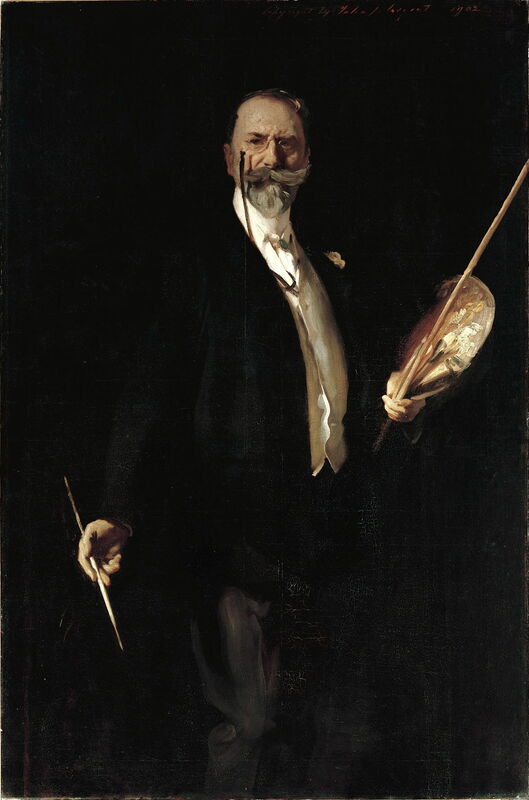 In 1892, he became an instructor to the life class at the Brooklyn Art School, and joined the advisory committee for the 1893 World’s Columbian Exposition being held in Chicago. 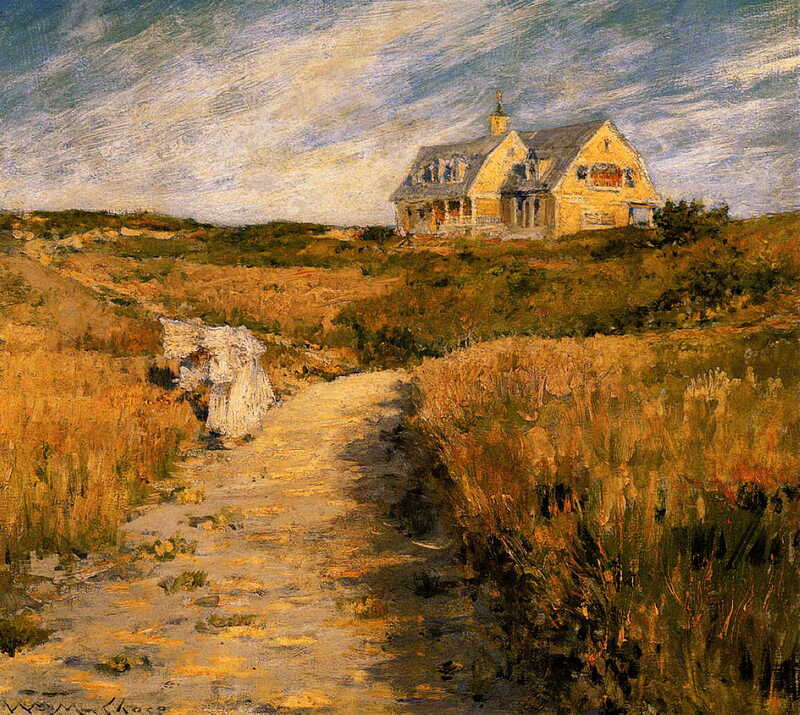 William Merritt Chase, The Chase Homestead, Shinnecock (c 1893), oil on canvas, 35.9 x 41 cm, San Diego Museum of Art, San Diego, CA. WikiArt. 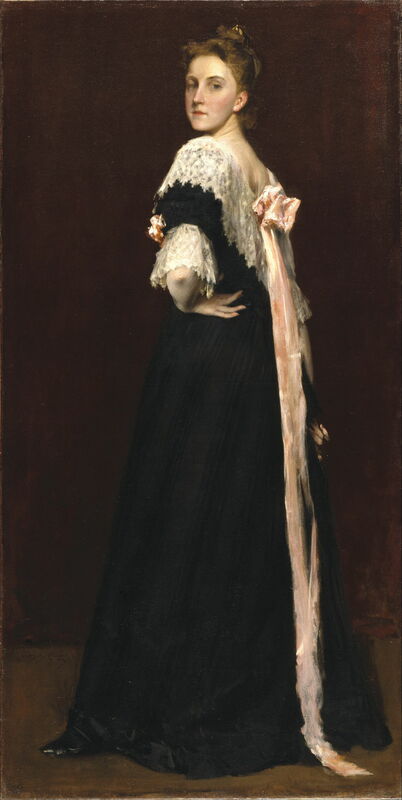 In 1894, the National Academy of Design held an exhibition of Portraits of Women, for which six of Chase’s paintings were accepted, together with some by John Singer Sargent, and other leading artists. William Merritt Chase (1849–1916), Gathering Autumn Flowers (1894/1895), oil on canvas, 53.34 × 96.52 cm, The National Gallery of Art, Washington, DC. Wikimedia Commons. Chase reviewed his commitments and studio facilities in 1895, and decided that it was time to move on. He closed his Tenth Street Studio, stopped teaching at the Brooklyn Art School, and the whole family moved to 234 East Fifteenth Street, on Stuyvesant Square at the northern edge of East Village; that was to remain their city residence until his death. 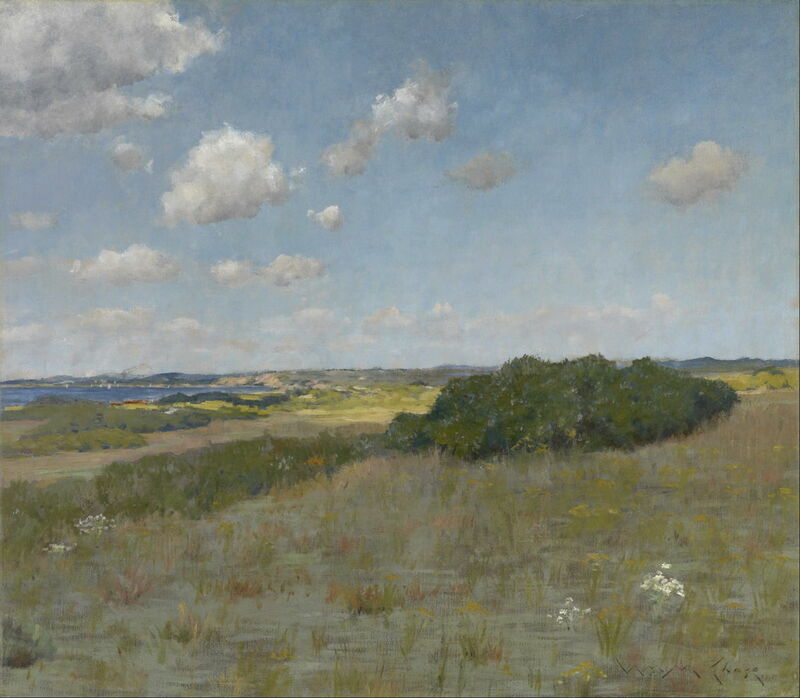 William Merritt Chase (1849–1916), Sunlight and Shadow, Shinnecock Hills (date not known), oil on canvas, 88.9 x 101.6 cm, Museum of Fine Arts, Houston, TX. Wikimedia Commons. 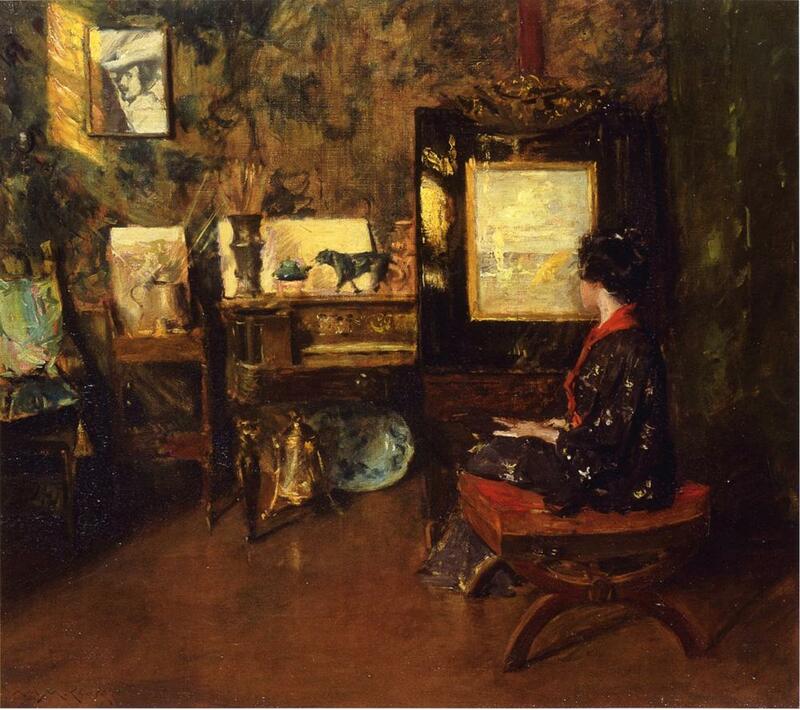 The contents of the old Tenth Street Studio were auctioned off in 1896, after which Chase, his wife, and two of their daughters took an extended trip to Spain. He taught there in Madrid, and returned in June in time to open the Shinnecock Summer School for another year. While he was busy with that, he accepted an invitation to teach at the Pennsylvania Academy of the Fine Arts, and in October he opened his own school, the Chase School of Art, at 106-108 East Twenty-Third Street. His teaching commitments in 1897 included life classes at the Pennsylvania Academy, the Shinnecock Summer School, and the first full year running the Chase School of Art. In 1898, Douglas John Connah (1871-1941) bought the Chase School of Art, and renamed it the New York School of Art. Connah had studied art in Weimar, at the Royal Academy in Düsseldorf, and at the Académie Julian in Paris. Chase continued to teach there until 1907. Chase was elected a member of the Institute of Arts and Letters in 1898. In 1899, Chase served on the national jury for the 1900 Paris Exposition Universelle. 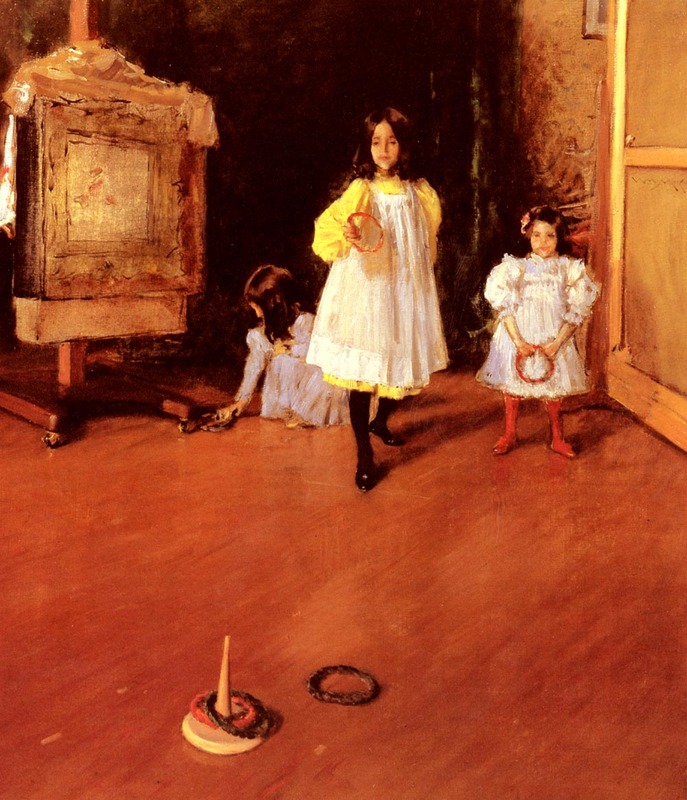 William Merritt Chase (1849–1916), Alice in the Shinnecock Studio (c 1900), oil on canvas, 96.8 x 108.6 cm, Parrish Art Museum, Southampton, NY. The Athenaeum. Chase visited the Paris Exposition Universelle in 1900, where one of his portraits won a gold medal. He also visited Spain briefly, and taught the usual Shinnecock Summer School. Posted in General, Painting and tagged Chase, Connah, Emmet, history of painting, Impressionism, landscape, painting, Sargent. Bookmark the permalink.